California condors Gymnogyps californianus, are the largest flying land bird in North America. Condors are members of New World vultures, Family Cathartidae, and are opportunistic scavengers that feed primarily on large dead mammals such as deer, elk, bighorn sheep, range cattle, and horses. Condors have a wingspan of 9 ½ feet, and can weigh up to 25 pounds as adults. Using thermal updrafts, condors can soar and glide up to 50 miles per hour and travel 100 miles or more per day in search of food. California condors are not sexually dimorphic like a majority of raptors, i.e., males and females are identical in size and plumage. Adult condors are primarily black except for bleach white feathers in a triangle-shape pattern beneath their wings (underwing covert feathers). These patches are highly visible when condors are flying overhead and are a key identification characteristic. 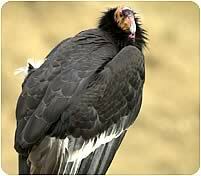 Adult condors have pinkish-orange featherless heads, ivory colored bills, and the sclera of the eye is red. Juvenile condors are also mostly black with underwing coverts that are mottled gray in color also but triangular shaped like adults. Juvenile condors have dark colored heads until they are about 3 to 4 years old when the head starts to turn pink. The juvenile bill is black and changes to an ivory as the bird matures. California condors are one of the most endangered birds in the world. They were placed on the federal endangered species list in 1967. In Arizona, reintroduction was conducted under a special provision of the Endangered Species Act that allows for the designation of a nonessential experimental population. Under this designation (referred to as the 10(j) rule) the protections for an endangered species are relaxed, providing greater flexibility for management of a reintroduction program. As a result of the continued downward spiral of the condor population in the 1980’s, one of the longest wildlife recovery efforts ever attempted began. The U.S. Fish and Wildlife Service began a captive breeding program in 1980, teaming with the Los Angeles Zoo and the San Diego Wild Animal Park. In 1987, a controversial decision was made to bring all remaining condors (22 individuals) into captivity and the last wild bird was captured on April 19, 1987. All hope for condor recovery was now placed on captive breeding programs, and the task was formidable. Because recruitment into the population is very low, captive breeding techniques were developed in which eggs are removed as they are laid, usually causing the captive condors to lay a second and sometimes third egg. The extra eggs are incubated and chicks are raised by caretakers using a hand puppet shaped like a parent condor head. The puppet prevents the young condors from imprinting on people. Condor chicks that are not raised by puppets, are raised by their parent birds. As a result of captive breeding, condor populations have increased dramatically from 22 birds in 1987 to more than 270 birds in 2005. Captive bred condors were released back into the wild in California beginning in January 1992. Today, about 100 condors fly free in designated California sanctuaries. With recovery going well in California, management efforts turned to the establishment of a second geographically separate condor population in Arizona. This effort would offer insurance against loss of the species through a single catastrophic event, and return condors to an additional portion of its historic range. Beginning in 1985, discussions began in The Arizona Game and Fish Department’s Nongame Branch to determine the feasibility of reintroducing California condors in Arizona. By 1989, potential release sites were being surveyed and regular scoping meetings with the U.S. Fish and Wildlife Service had begun. In 1994, The Vermilion Cliffs were identified as the best release site. Reintroduction efforts were now in high gear in Arizona, and another major project partner joined; The Peregrine Fund, a private, non-profit conservation organization headquartered in Boise, Idaho. In 1993, The Peregrine Fund was selected to conduct the on-the-ground releases, daily monitoring and feeding of condors, and provide a third captive breeding facility. Other cooperators included the Utah Department of Natural Resources, the Phoenix, Los Angeles and San Diego Zoos, the Hualapai Tribe, the Navajo Nation, Glen Canyon National Recreation Area, Grand Canyon National Park and the Kaibab National Forest. Also involved were Parker Dairy, Rovey Dairy, and Mountain Shadows Dairy that donated stillborn calves for condor food. In October 1996 six birds were transferred from captive breeding facilities to an acclimation pen on top of the Vermilion Cliffs. Before release each condor was fitted with two radio transmitters and individual number tags. Transmitters and number tags were affixed to the patagium (a section of skin and tendons that lies along the leading edge of the wing) of each condor’s wing. On December 12, 1996 six condors were released atop the Vermilion cliffs. This was the first time condors had been seen in Arizona since the early 1900’s. Since December of 1996, program personnel have soft-released approximately 6-10 birds per year. Each condor carries two radio transmitters (conventional and/or satellite transmitters) and are monitored daily by up to 10 field biologists. There are now over 70 condors flying free in Arizona. 1- Never try to approach or feed condors. Use binoculars and spotting scopes to observe condors from a distance. 2- Never stop, excessively slow down, or view condors on Highway 89A. Use pullouts along the road to search for and view condors. 1) Continue daily monitoring of condors. 2) Addition of more satellite and GPS transmitters. 3) Expansion of the 10(j) area. 4) Establish a medical treatment facility near the release site. 5) Continued education programs on condor reintroduction.